If you have been experiencing strange redirections to suspicious websites and an increased number of third-party advertisements, ShutdownTime may have slithered onto your computer. This application may not be a dangerous threat itself but it may come with an adware program that could actually put your virtual security at risk. Thus, we have labeled it as a potentially unwanted program (PUP). This category does not mean that you need to be afraid of losing your files or other types of security breaches directly coming from this program. Still, it is important to understand how this PUP behaves and what kind of potential risks it may hide to keep it on board. We believe that it is safer for you to remove ShutdownTime along with the related adware program and all unrelated suspicious applications. Please read on to find out how you can protect your PC against similar threats. This useless PUP is promoted on its own website at shutdowntime.com but you cannot actually download it there even though there are multiple download links and buttons. In fact, clicking on the download links will simply reload the page. However, when you click on the Download buttons, you are forwarded to a Twitter page (twitter.com/SBootstrap) that seems to have nothing to do with this tool. Obviously, there seems to be no official way for you to install this tool. So how is it possible that it is on your system at all? Well, unfortunately, this PUP may spread under questionable circumstances, which could be enough for you to delete ShutdownTime. User reports and our research also indicate that this PUP can be found bundled with other threats that may pose direct threats to your virtual security, such as adware programs. Free software packages can bundle all kinds of PUPs and malware infections in order to infect unsuspecting computer users. In fact, this is how so many users generally infect their system with adware programs, browser hijackers, fake alerts, keyloggers, backdoors, and, of course, PUPs. Such a bundle can be downloaded when you are looking for a free or cracked file on the web and land on an unfamiliar suspicious file-sharing website. Such pages tend to promote questionable third-party installers that can pack several malicious threats. This is why we advise you to always download from official and reputable sources. It is worth running a web search on the website and the application in question too to be on the safe side. Yet another option is that you simply click on a corrupt third-party advertisement on a shady website or such an ad could also be presented to you by malware on your system. No wonder why we emphasize that you should make sure that your computer is clean before you go surfing the web. If you notice that there are more and more third-party ads while you are browsing, you should definitely run a reliable malware scanner on your system. But before you do so, you can delete ShutdownTime and the related adware infection for starters. We have found that this PUP is very similar to Speedownloader. 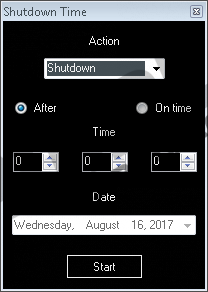 It offers you a very primitive graphical user interface that you can use to set up a date and time to switch off or on your PC. However, the real problem is that this PUP may also install an adware program that can load a questionable page (ladomainadeserver.com/redirect) in your browser that can forward you to potentially unreliable promoted third-party websites. This adware has a random name and can be installed directly to your “%PROGRAMFILES%\” and “%PROGRAMFILES(x86)%\” folders or in this PUP’s folder like “C:\Program Files (x86)\M4IS7KPXV7\M4IS7KPXV.exe” or “C:\Program Files (x86)\ShutdownTime\CNDBA.exe.” When you click on questionable third-party content, you should know that there may be consequences. You could easily drop further infections onto your system that may be way more dangerous than this PUP. Also, you may get redirected to fake websites run by cyber criminals where you could be tricked into revealing your personal and banking details. If you do not want to experience such awful scenarios first hand, we suggest that you do not hesitate to remove ShutdownTime and all other possibly harmful programs as well. Fortunately, you can easily uninstall this PUP by running its uninstaller via Control Panel. It is not difficult to find it in the list of installed programs. If you need assistance with this, please use our guide below this article. The problem is that this uninstaller does not take care of the adware program. Therefore, you need to eliminate that manually. We suggest that you delete the random-name folder or file if you find it in the aforementioned directories. If this is more than you can do manually, we advise you to start using a professional anti-malware program like SpyHunter that can automatically tackle all known malware infections and PUPs, too. Click on the uninstaller in the list and click Uninstall. Click on the uninstaller in the list and click Remove. Quick & tested solution for ShutdownTime removal.